This is yet another one of those culinary ideas that I kick myself for not figuring out on my own. It makes perfect sense. 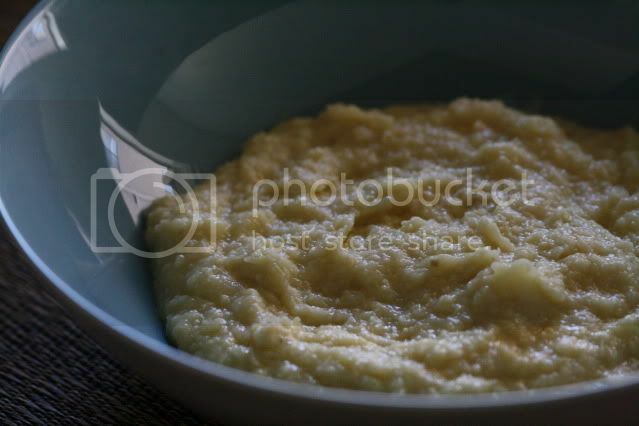 Polenta is made from milled corn, dried and packaged and sent to you to be reconstituted and simmered away on the stove. Why not capture the intense summer flavor of corn by grinding corn, straight off the cob, in a Cuisinart, at home to enjoy the sweet fresh flavor of corn in a whole new way. Somewhere between creamed corn and polenta, this turns out much sweeter than the polenta you're used to. Serve it as a side dish to a hearty savory stew and the sweetness will perfectly balance the salty savory nature of your main course. Cut the corn from the cob and place in a saucepan with the water. Bring to a simmer and cook for 12 minutes. Drain the corn, reserving the cooking liquid. Transfer the corn to a Cuisinart and process for several minutes to break down the corn as mush as possible. Return the milled corn to the saucepan and add the cooking liquid. Cook over low heat for 10 to 15 minutes, stirring frequently, until thickened. Fold in the butter and season the polenta with salt and pepper to taste. Now that appeals to me way more than bog standard polent. Yum! My mouth is watering. That sounds fantastic! What a brilliant idea! I served polenta a lot, but never would have thought to go straight to the source to make my own fresh corn version. This is the perfect time of year to give it a try! Wow! That is a very creative side dish. Thanks for sharing it with us. Oh Jesus, what's a com? so nice to meet you yesterday. the corn sounds delicious and I love your photos. Look forward to seeing your new posts. This is so cool. I had no idea that you could just "make" polenta. Of course, I never thought about it. I am definitely going to try this. What a fantastic idea! I adore polenta and cook with it a lot but I'm now desperate to try this. Corn is now added to my shopping list! Hey your creative Polenta recipe really admires me a lot and the idea of introducing milled corn is yet another admirable thing...just can't resist to try this one soon...! !